In the beginning to was not called the bluegill cup. At first, it was just a holding tank for my rejects. Once the water begins to warm, start tossing bigger, brighter flies. We might not catch every bluegill that’s in the pond, but that doesn’t matter when the big one sends the drag screaming. It's no secret that bluegills and other members of the sunfish family are attracted to color. The exact color that turns them on may vary from day to day or even hour to hour. In my neck of the woods, orange is a long standing favorite day in and day out. This particular pattern was created during a tying session when I was refilling one of my still water, trout boxes with damsel fly nymph patterns. I had just finished tying a few dozen damsel fly nymphs for my annual pilgrimage to Grebe Lake in Yellowstone National Park. My tying desk was littered with 2x long nymph hooks, bead chain eyes and a material I was using to add legs to a new damsel fly nymph pattern I was experimenting with. Truth be told, I could have simply continued tying the same pattern and throw some in my panfish box and call it day. Damsel fly nymph imitations are some of my most productive sub surface bluegill flies. I had something different in mind. I wanted to add a little bit of color to the fly and change up the profile a bit. The olive marabou tail was replaced with a small tuft of UV orange marabou. The slim marabou dubbed body was replaced by winding the polar chenille material I was using to imitate legs on the trout patterns. 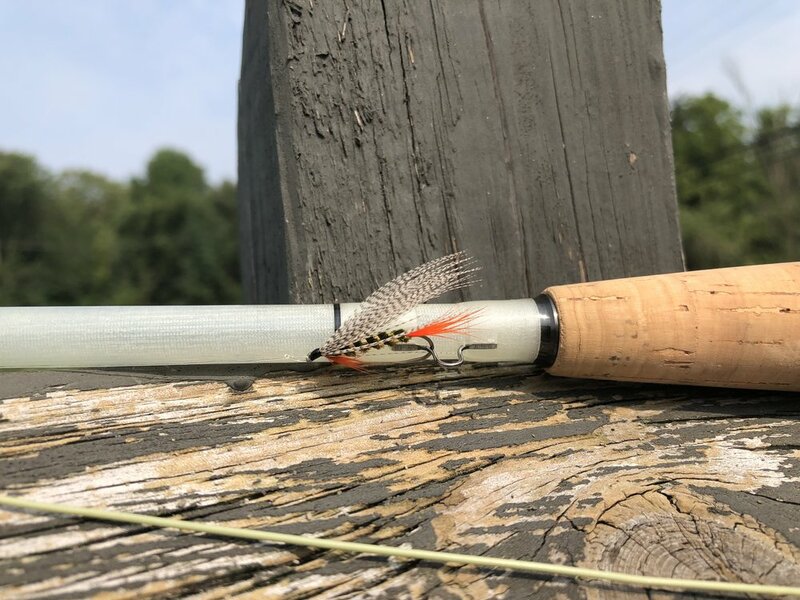 The result was a fly that was incredible easy to tie, had a bright spot of color at the business end of the hook, had just enough weight to break the surface tension of the water and enticingly sink to the bottom and created a lot of movement in the water. The UV olive brown polar chenille created a fly with lots of leg like appendages that move in the water even when the fly is slowly sinking or at rest. Every twitch of the line brings the fly to life. In addition to being an attraction to the fish, the orange tail works like a strike indicator under some conditions. Panfish can be masters camouflage at times. In waters with certain bottom types, they are damn near invisible. Fortunately, over those same bottoms, the orange tail of this fly glows like a beacon. I have often detected strikes when the little spec of orange I had been staring at simply disappeared. When that occurs it is usually because a fish approached the fly from behind and sucked it in with out grabbing it and running off. If I did not set the hook at the visual clue, the fish would have likely rejected the fly a split second later. If I was not able to see that little spec vanish before my eyes I would have not been able to pick up on the hit. Crappies are masters of this method of feeding. Time and time again I have seen fish take these and other flies and have never physically felt the actual taking of the fly. Many of my bluegill sub-surface patterns are tied on 2x or 3x long hooks. I find that a longer hook helps when releasing the fish. Bluegills and sunfish have very small mouths and removing a deeply set hook usually results in injury to the fish. A longer hook often will be easier to I dislodge even when taken deeply by the fish. The 2xl hook on this pattern fits the bill perfectly. I have experimented with other colors for the body and tail and all have worked well, but the olive brown/orange combo is my by far my favorite.